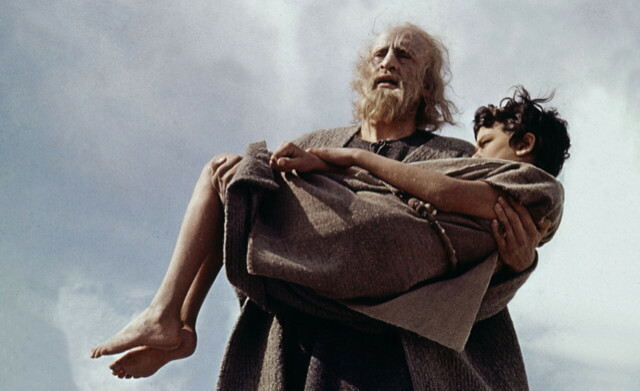 THE BIBLE…in the beginning—–credit director John Huston and producer Dino De Laurentiis with audacity, in making a stab at filming the ‘unfilmable’. They stopped at the 22nd chapter of Genesis, or the movie would have run on for two or three months. Depending on your patience for things religious, you may feel like it has, if you stick for the fadeout after 174 minutes. This may be best appreciated by either the very devout or the very cynical. I’m miles from devout about the sort of fairy tales that involve a threat, but I fancy tempering my cynicism with earnestness and a willingness to admit I’m often as clueless as the next guy in line. If you have an agnostic bent and can yet appreciate artistic attempt, you’ll find a number of rewards in this underrated 1966 epic. Michael Parks was enlisted as Adam and as Eve Huston chose Ulla Bergryd, a 19-year old Swedish college student. Richard Harris plays (raises?) the marked Cain, with 24-year old new face Franco Nero the unfortunate Abel. Beautifully lensed with what amounts to reverence by cameraman Giuseppe Rotunno, though the pace is a wee deliberate; despite the loveliness of the color, you may begin to forget Eden and start focusing on your restless rumpus, wondering if it can make it through the rest of the fable if it goes on at this pace. Just as you begin to drift off to the Land of Nod, the movie changes tone, with the story of Noah, played with earthy humor by director Huston. This segment charms, with the awe of the Ark (there are great sets throughout) and the innocent wonder of the animal parade (wonderfully staged). This portion could have been released on its own as a short feature. It’s a gem. After The Flood comes a spectacular Tower of Babel sequence with Stephen Boyd playing Nimrod. The brief but enormous Battle of Sheva is suitably grand scale. Peter O’Toole is okay as the Angel of Death, delivering the bad news to Sodom. The degenerate inhabitants of the original Sin City are presented in eerie fashion, and the lighting, costuming and makeup are especially effective here. The last, lengthiest segment deals with Abraham and Sarah. George C. Scott does what’s required, and very well, even if his already throaty delivery gets extended to the heavens, as it were. As he’d done in The Night Of The Iguana, Huston once again coaxed a powerful performance from Ava Gardner—they both cared deeply for the other. Locations include Italy, Egypt, Iceland, the Galapagos, Israel, Morocco, Sicily and Sardinia. With Gabriele Ferzetti, Zoe Sallis (the 24-year old Indian beauty was Huston’s stunning companion, and mother to son Jack) , Pupella Maggio, Alberto Lucantoni, Anna Osso and Eleanora Rossi Drago. Screenplay by Christopher Fry, with narration by the director. * Huston had spent years preparing the project. In his words: “I’m not a orthodoxly religious person, and I don’t profess any beliefs. The mystery of life is too great, too wide, to do more than wonder at. I envy those people who have it all down pat.” The Oscars ignored the wonderful art direction in this and didn’t bother to even give it a nomination. Fantastic Voyage was the winner—fair enough, yet they nominated the cheesy The Oscar and not this? 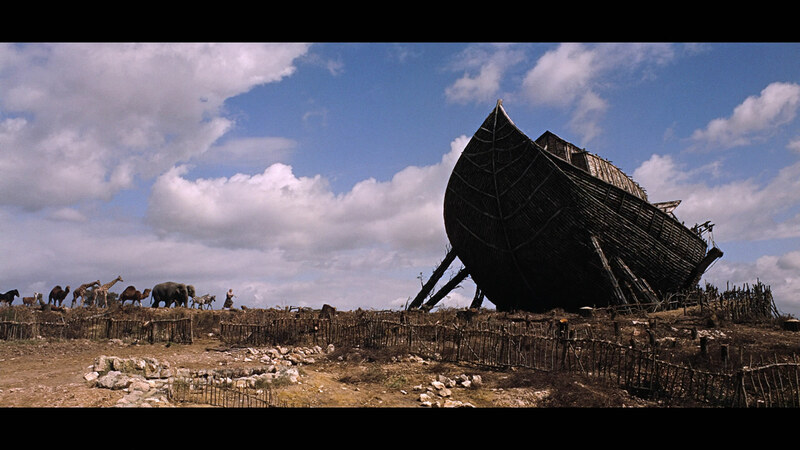 Five different Arks of various size were constructed; the largest was 200 feet long, 64 feet wide and 50 feet high. Shooting in Egypt for the Tower of Babel segment involved 6,000 extras and brought Huston headaches similar to that which beset Howard Hawks on Land of The Pharaohs. The Egyptian government rounded up “undesirables” from the streets to use as extras, and didn’t see fit to provide them with water. A stone-throwing riot ensued. This Book makes people do crazy things.